The people who follow me on Twitter already know that I returned from Australia earlier this week. I went there with my mother to visit some of our relatives. When it became known that I would be in Australia, Paul van Bellen of Gazelle Bicycles Australia asked me if I would be willing to do a presentation “for the Australian fans”. When I said “yes” I had no idea what kind of event it would eventually become. BIKESydney organized it and on the Facebook page for the event over 80 people confirmed they would be coming. 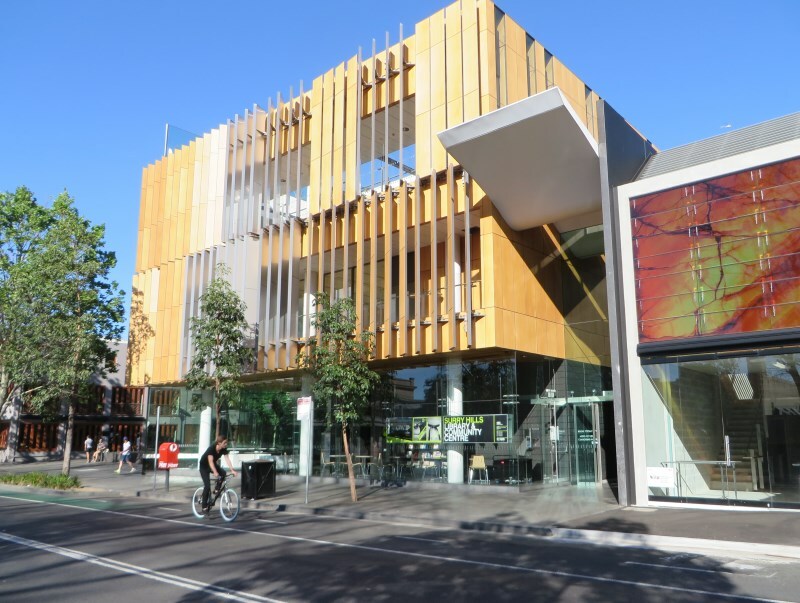 A venue was found in the Surry Hills Library. 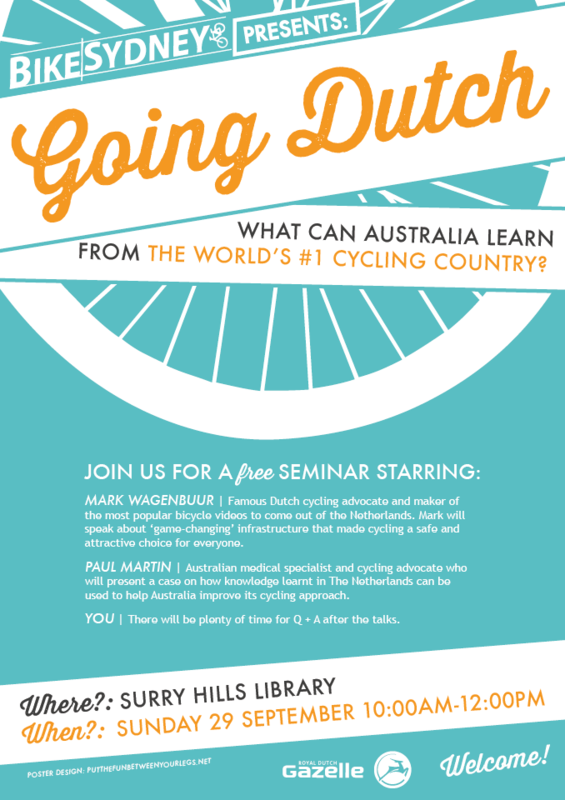 Paul Martin from Brisbane was prepared to come all the way to Sydney especially for this occasion, to tell about his experiences on a now legendary cycle trip through the Netherlands in 2011. (This trip by 30 Australians was featured in a blog and I had made a short video about it too.) The event was subsequently named a ‘Bike Seminar’ to increase the pressure I already felt, I am sure. Surry Hills Library in Sydney where the seminar should have taken place. On the morning of the 29th of September we got to the Surry Hills library to find there was a power outage after a fire in a substation. This not only meant that we couldn’t do our presentations there without the computer and projector working, but we couldn’t even stay in the building at all. Security threw us out because that was against health and safety regulations. David Borella of BIKESydney did everything he could to get a new venue at a moment’s notice. 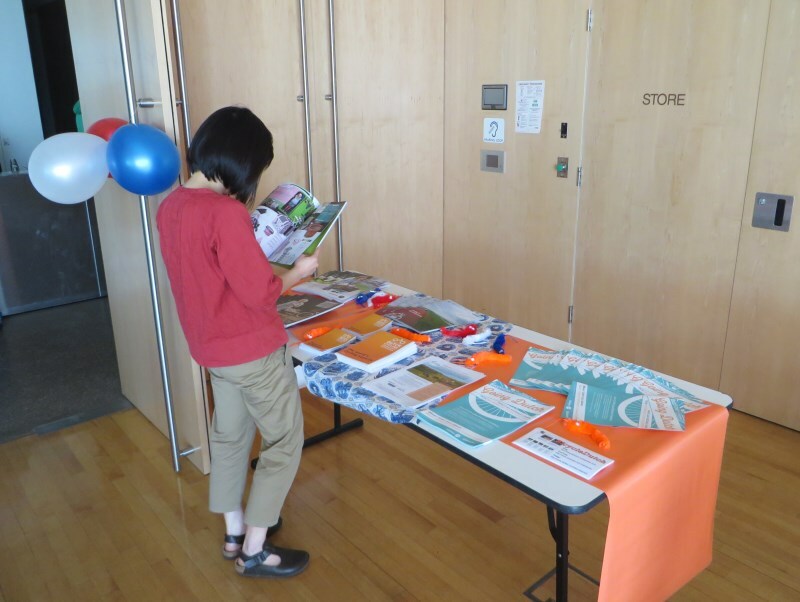 A table with folders and leaflets about cycling in the Netherlands from among others the Dutch Cycling Embassy. Waiting for what was going to happen in Surry Hills Library. 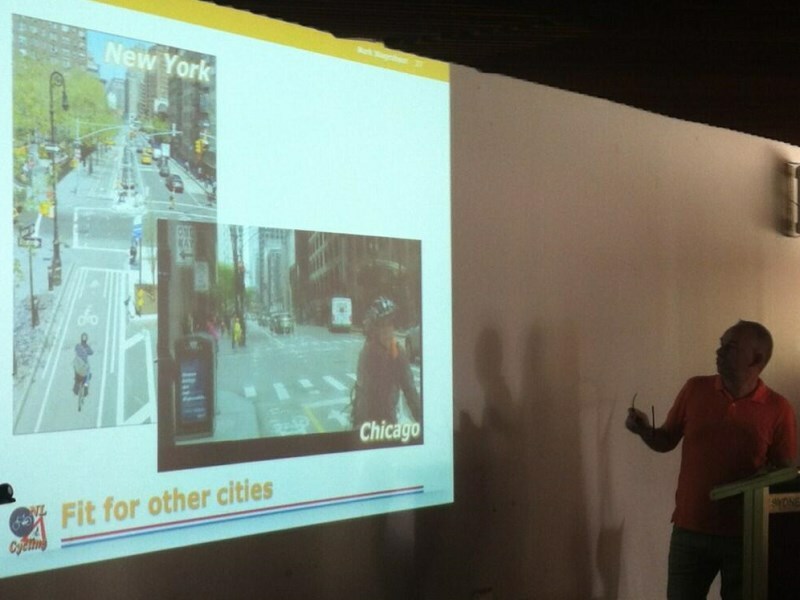 It was fortunate that Fiona Campbell, manager Cycling Strategy of the city of Sydney had come to the seminar. She was able to arrange a room in Sydney’s Town Hall where the event could take place only hours after the originally planned time. 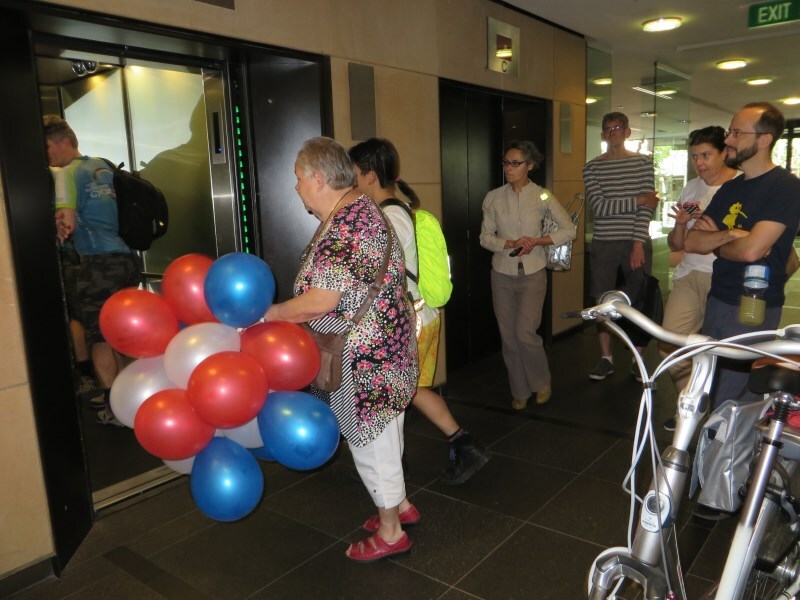 So we packed up the balloons, the Dutch flags, the leaflets and the folders, all of which I had brought from the Netherlands and moved with most of the remaining audience to the new location. People arriving in Sydney Town Hall where the seminar was relocated. My mother carried the balloons. Paul Martin’s presentation was excellent! He was able to compare the situation in the Netherlands with Australia much better than I could, because I am of course not so familiar with the Australian situation as someone living there. In my presentation I tried to give a quick overview of how the Dutch got to their current policies and what other societies could copy and what some already do copy. 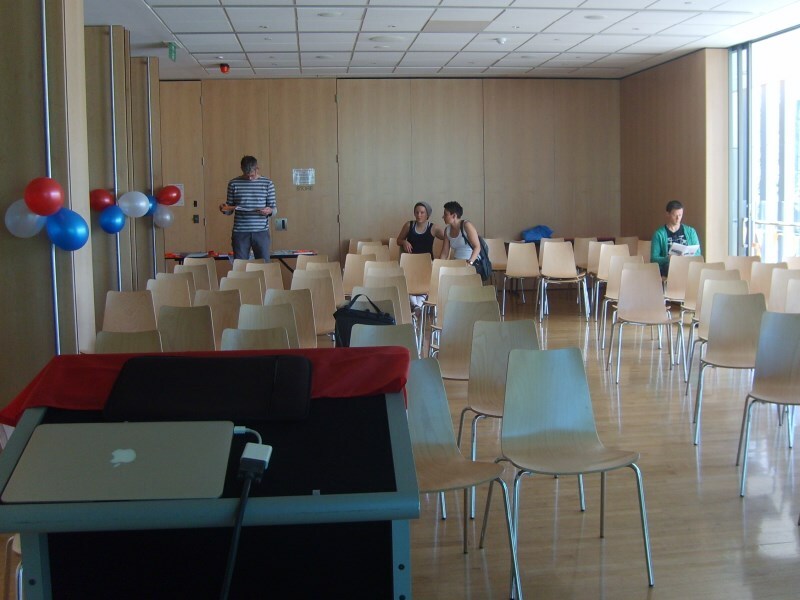 People responded very enthusiastic to my presentation. Which was a relief, because this is not something I do very often and I actually should get more practice to become more confident. Making videos and writing a blog is really very different from being in front of an audience. Interestingly enough, my mother, by far the most critical member of the audience, was more impressed by how I did the question and answer session than the actual presentation. 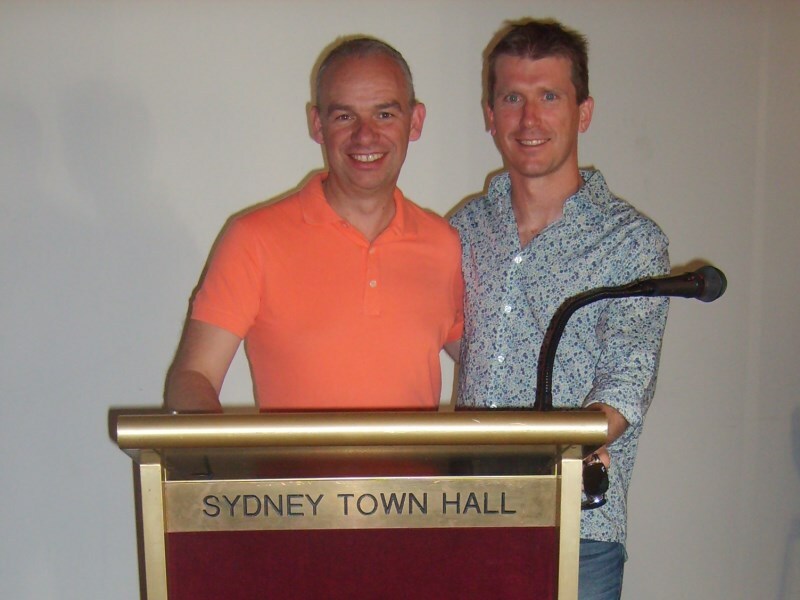 Paul Martin and myself were the speakers in Sydney Town Hall. All in all the event was a success I think. And it was made possible with the help of many people, some of whom I already mentioned and all of whom did this in their own time and at their own expenses. A big thank you to all of you! The presentations were filmed. But I do not know if, how and when these images will be made public. When I do know, I will make sure you’ll hear about it. Poster for the seminar designed by Elin Bandmann. I spent 5 days in Sydney so I also had some time to look around. It has become sort of a tradition that I make videos of places I visit during my holidays and I did this in Sydney too. A video showing what struck me in Sydney. The first thing you notice as an outsider is the sound, or better the noise of motor traffic. Not only because there is so much motor traffic but also because it drives so fast. It also seemed to me that all that traffic couldn’t have a business in the city centre. When I rented a car a few days later to go to the Blue Mountains (west of Sydney) this was confirmed. The navigator sent me right through the centre of Sydney. No wonder it is so busy there if even traffic that has a destination very far away from it goes right through it. So a lot can be won by diverting traffic away from there. It is strange that I would think there is so much motor traffic because in reality 92% of all traffic in the centre is on foot (figure by the city of Sydney). Yet everything is designed for that motor traffic: even the smallest side streets and driveways cut right through side-walks forcing pedestrians to go up and down big curbs. The pedestrian majority also gets very short green times. I timed green lights at 7 seconds (even though that was not in the centre but in Darlinghurst). The red time was of course much much longer! Because of all this it is no wonder people flock to where there is less motor traffic. Darling Harbour, the Rocks and Circular Quay are magnets for people walking. That the city of Sydney plans to pedestrianize part of the main shopping areas in George Street and surroundings, seems to me like a very good idea that will improve the livability of the city centre. Where pedestrians and people cycling mix the cyclists have to give way to the pedestrians. Many more people were riding bicycles without wearing helmets than I had expected. I was told Sydney doesn’t really enforce the mandatory helmet laws and the fine is relatively low. I saw very different types of bicycle infrastructure. I cringed when I saw people cycling in the combined bus/bike lanes in the incredibly busy Oxford Street. A bus/bike lane gives you bus/bike conflicts and they are extremely dangerous because of the difference in size/mass and speed. In William Street I saw narrow cycle lanes and people choosing to ride on the sidewalks instead. All in all not a very inviting environment to cycling. At several bigger junctions in the city I saw two solutions for cyclists. Brave and fast cyclists choose to ride through the junction. Other people could leave the roadway via a lowered curb to ride on the sidewalk and cross the junction at the pedestrian crossing. 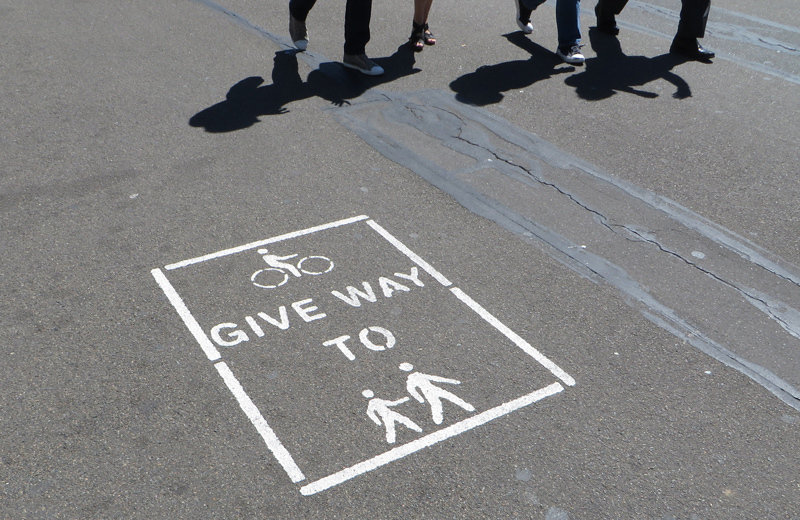 Whereby the cyclists have to give pedestrians priority. This isn’t a good solution for either of these road users. A dual system is never a good idea, it decreases the predictability of behaviour. If cycling infrastructure is not good enough to be used by all people cycling it is simply not good enough. 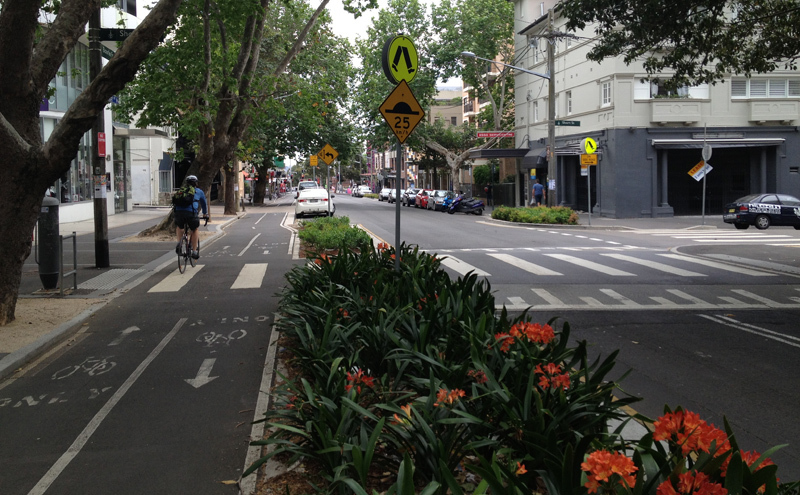 The separated bikeway in Bourke Street, Sydney. This planted area prevents cars to be parked close to the pedestrian crossing which improves sight lines. Note that the crossing is raised and that that is made clear to drivers with the shorter and longer white lines. Exactly the way it is done in the Netherlands. 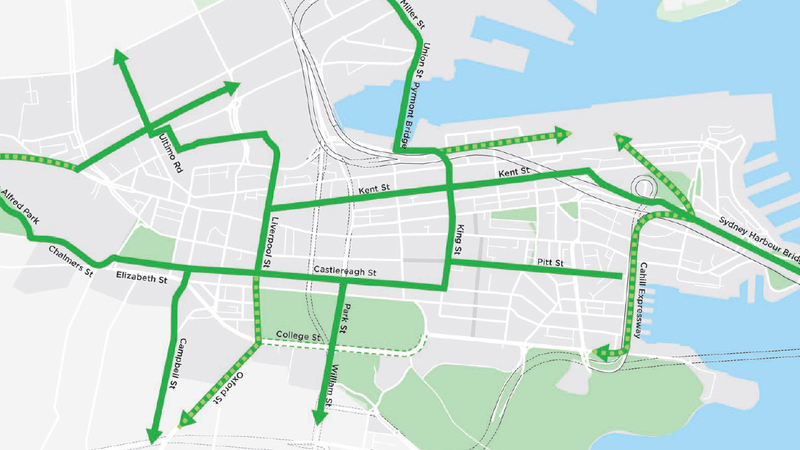 The proposed Sydney bike network in the city centre. Picture from the Sydney City Centre Access Strategy. This picture also shows College St. (the dotted line in the bottom of the picture) from where the existing separated bike way will be removed. All in all I saw a Sydney that has changed considerably since I visited it last in 2008. And it was a change in the right direction. I hope this continues so the environment for cycling improves. Something that is very needed as cycling is in decline in most of Australia. After Sydney I also visited Brisbane where I did also ride a bicycle myself. There will be a blog post about that on a later date. Another thing to note is that Sydney is quite hilly when compared to just about any place in the Netherlands. Steep hills tend to make cycling less attractive, and encourage more motor vehicles. My understanding is that the reason that the cycleway you mention as being removed was actually removed because the Provincial Government, which had built it and controlled it, so strongly hated Sydney’s plan for new cycling infrastructure (the only reason why I can imagine is corruption) that they removed it just to spite the City of Sydney. Suffice to say, they are doing this on their own. This is a great way of treating cyclists. Thanks for this good information. I live in Melbourne, and a great deal of our cyclists are darn awful riders. One problem I have with shared paths is that cyclists pull around pedestrians without actually sounding their bells. I get shocked by this when walking on them. A procedure I have adopted is to walk on the right of a shared path (we ride on the left) whenever the way is clear. I watch for bikes coming the other way, and then one comes, I look over my shoulder and then move. The primary issues with our cyclists, I think, is road user education, particularly with roundabouts. Many think the rule at roundabouts is to give way to your right, but that does not apply to vehicles that arrive at the roundabout at the same time. You give way to what is on it, roundabouts are designed to avoid conflict between vehicles that arrive at the same time. Any idea what giving way even means? When I ride, I treat roundabouts as they are supposed to be treated. If I turn right (which would be left on mainland Europe), I try to arrive at the same time as anything coming towards me or after anything coming towards me and going straight. The secondary issue is more separation between bikes and pedestrians, and maybe allowing bicycles to proceed on red lights with left turns into dedicated bike lanes, under the same rules as for turning left at a stop sign. Perhaps the infrastructure is the problem: bad infrastructure often leads to people inventing procedures for how to use junctions. There are two fundemental issues here in Australia. One is lack of dedicated cycling infrastructure and the other is rider education. Mark, that was really a great video. All the more so as you took time out of your holiday to do it. Well done! @hcdr Actually, as a Melbournian, I really do hope Sydney overtakes Melbourne as Australia’s premier cycling city (if it hasn’t already). It will give us something to aim for! Nothing motivates Melbournians more than trying to compete with Sydney!! awesome! We need more people like you in Sydney to get rid of all the traffic and pollution! I say bring on the cycling! You had a great trip Mark and did a very good job in presenting the Dutch cycling culture. For us in the Netherlands it is too common to take notice of it, but it is really worth all the efforts to inform people abroad. And you made an excellent video, specially at 2:58, superb shot! The yellow diamond warning sign in your video is one of the coolest signs I’ve viewed. Anyway, thanks for the video about Sydney, Australia. On a different note, I’ve been to the Netherlands for one of David Henbrow’s Study Tours. After 10 days in the Netherlands, it was really sad to be leaving Cycling Paradise. Maybe one day I will return, meet up with you, and compare infrastructure in different places over some beer… good beer that is. I too did David Hembrow’s Study tour as well as the self-guided holiday tour. I was in the Netherlands for three glorious weeks in June. It was a bit depressing returning to the US. Was great to meet you – and thank you for crediting the poster! I’m amazed you even credited that crappy Iphone image… ha ha. Will try to send you the nicer images this week! Great story and sounds like a great trip! Let’s hope cycling will become more important in Australia, a beautiful country for cycling. Combined buslanes and cycle-lanes? What the hell are those people thinking? That’s like putting a known child-molester to work in a daycare center. Need not be a bad combination. Groningen (you know, the Dutch city with the highest modal share of cycling) has a number of one-way streets in the old town for buses and bicycles only. Bus drivers are trained to look out for suicidal bikers. Your video is one of the best overviews of cycling in Sydney that I’ve seen. I’m amazed you put it together in just a short visit. Come back – it’d be great to organise more seminars around the country. Newcastle is in! I like how you take your travels as an opportunity to do some research on the local cycling conditions. Please keep doing it! It seems Sydney is on the right track. Also, it’s hard to believe that cycling is on the decline in Australia- quite the opposite of the United States! Even though they both had similar cycling rates in the recent past (and probably still do, I haven’t checked the stats recently). That bike route superimposed on a bus lane is frightening. I’ve seen a similar condition in Berlin in 2010. A likely candidate for the cause of the decline of cycling in Australia is mandatory helemet laws. I have been looking for an Australian summary or a review of the event, but haven’t found one yet. Do you have any links? This is great and comprehensive stuff as usual Mark. Thanks for a look at Sydney (I only got to Melbourne while down there.) I have heard both great and bad about Sydney and this confirms it. Great commentary and video. Thank you. And thank you for highlighting the size of the pedestrian majority and how it is treated. Also, foreign readers should be aware that the “Mad Max” series are actually documentaries about Australian road conditions, and not action films as is the common misconception. True! You really captured the Australian cycling experience. From this, I’d say Sydney will overtake Melbourne as the cycling city of Australia. Melbourne seems to be spreading funding thinly to go for quantity over quality, or simply implementing cheap ‘incremental’ improvements or touch-ups. Perhaps it can pay out long term, but the result for now is a lot of new bike infrastructure is disappointingly inadequate, and invites poor behaviour from road users. Excellent summary, Mark. Thanks again for your time & consideration considering none of this was the intent of your holiday. 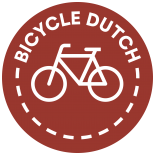 This entry was posted on 17 October 2013 by Bicycle Dutch in Original posts and tagged Australia, infrastructure, Sydney, urban planning.